Well now that Halloween and Bonfire Night are over with it my thoughts are 100% focused on Christmas. It seems that John Lewis have done it again. Have you seen this years Christmas advert? Every year their adverts get people talking and this year is no exception. I wasn't too keen when I first saw it but having watched it a few times more on YouTube it has definitely grown on me. It gives you that little flutter in your tummy. I love the way that Christmas adverts can do that to you. Another favourite this year belongs to the Found It teasers we have been getting. Where the little girl peeks through the cardboard box or under the covers. The suspense almost killed me with these. Have you seen them yet? I won't ruin it for you just in case you are more patient then I am (I have cheated and looked it up on YouTube) I must say I'm glad I did though because I like them even more now I know what is soon to follow. I can't help but get excited for Christmas. I am quite literally just like a kid. I love it. And these amazing adverts definitely help to get you in the mood. I can't believe I haven't seen the advert yet and I refuse to watch it on YouTube it's the fun of waiting for it to appear on the tv!! 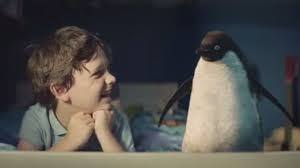 I really love the john lewis ad and I saw the Coca cola one last night ..... love it!